Sherlock Holmes has become almost something of a cliché. The deerstalker hat, the pipe, the “Elementary, my dear Watson”, the versions and revisions of the character and the stories have, over the years, greatly reduced the character from Sir Arthur Conan Doyle’s great scientific mind to something that passively conjures up a few of the notable tropes listed above or, quite possibly, a mental picture of a basset hound. Guy Ritchie attempted to shake loose the image of Holmes with his recent cinematic take on the character, although, for my money, there wasn’t much that was particularly Holmesian about the character, instead the film was more like a chance to watch Robert Downey Jr. in an installment of the Crank series, wearing fancy clothes. My point is Sherlock Holmes felt sort of tired and done. Which is why all three hour and a half episodes of the BBC’s first season of the renewed series, Sherlock, was such a wonderful, wonderful surprise. Sherlock takes literature’s greatest mind and moves him and his counterpart, Dr. John Watson, to modern London. Holmes, a “consultant” for the police, takes on London’s crime puzzles using modern day technologies like texting and the Internet as he methodically works through the clues the police, and we the viewers, often overlook. 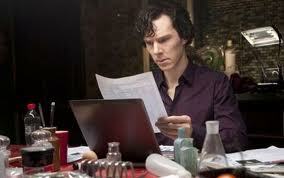 Sound like a dumb recipe for disaster, Sherlock Holmes using his Blackberry to Google things? Well, it’s not. And the reason why it’s not is actually one of the largest reasons why the show succeeds. Sherlock, the character, uses these devices as tools in his arsenal to make his connections, verify his logic, and to move to the next step. Because, at the core of the show, Sherlock is about the character, not the crimes. This is no CSI. Steven Moffat (the man who is currently running the latest iteration of Dr. Who for the BBC) knows what is fascinating and puts the focus of the series squarely on that: Sherlock isn’t about the audience solving the mystery along with Holmes, it’s about watching and marveling as we, one step behind the titular character, continuously play catch up with the man as he puts the pieces together. Sure, the clues are often there, but they’re mostly alluded to subtly until Holmes pulls the mystery together for us at the very end. Instead, Sherlock spends the first three episodes watching this character and how he develops (or doesn’t) relationships with those around him. True to form, the audience’s avatar in this series is Dr. John Watson. We meet Holmes along with Watson, and the series artfully uses the character to mirror the audience’s thoughts on Holmes. At multiple points throughout the three episodes, Watson vocalizes our feelings of awe as Sherlock draws correct conclusions from seemingly innocuous details, expresses our bristling thoughts as Sherlock’s complete lack of care for people’s feelings, and at one point, during episode three, calls out Holmes’s enjoyment of “the game” when actual lives are at stake, only to have Holmes yell back a brilliant retort about heroes that perfectly sums up the character and resets Watson and the audience’s perspective on Holmes. The season has a great arc, with the characters that are fully realized, developed (shy of maybe one or two ancillary characters [Sgt. Sally Donovan, I’m looking at you]), and grow. But that’s not to say that the procedural mysteries that act as the catalyst for each episode are pushed aside or undercooked. Each of the three episodes, “A Study in Pink”, “The Blind Banker”, and “The Great Game” all have gripping puzzles for our protagonist to solve. Each story is fleshed out, and whether you find the resolutions satisfying or not (I’ll concede that I wasn’t slack-jawed at the reveal at the end of “A Study in Pink”, although the final game that was played after that reveal was yet another perfect character study of Sherlock Holmes), you can’t help but acknowledge that they weren’t haphazardly thrown together. Everything about these stories were thought through and relayed back to the audience. 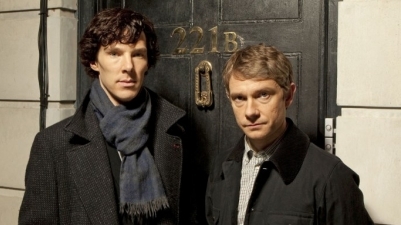 The two main characters, played by Benedict Cumberbatch (who has quite possibly the most British name ever) and Martin Freeman (from the classic BBC series, The Office) inhabit and exude Holmes and Watson, respectively. This is truly excellent television. If this review sounds like a loud trumpet blast touting the greatness of this series, good, that was my intention. Sherlock truly bowled me over with how much of a total package it was. Excellent casting/acting, producing, writing, direction, Sherlock spent its first season saying so much in only three (albeit long) episodes. I’m already clamoring for the second season, which I hear is hitting the British airwaves come August of this year. That season finale cliffhanger was about as nailbiter as they come. Watch this show.